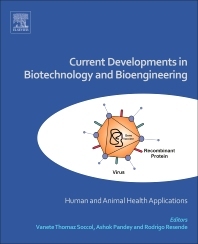 Current Developments in Biotechnology and Bioengineering: Human and Animal Health Applications provides extensive coverage of new developments, state-of-the-art technologies, and potential future trends, presenting data-based scientific knowledge and information on medical biotechnological interventions for human and animal health. Drawing on the key development areas in this field, the book reviews biotechnological advances and applications in immunotechnology, vaccines and vaccinology, combinatorial libraries, gene and cell therapy, tissue engineering, and parasite and infectious disease diagnostics. This title outlines why biotechnological techniques in these areas are useful in a clinical context and considers their potential uses, limitations, and the ethical considerations surrounding their use. 5. An 'omics approach towards CHO cell engineering. 18. Phage display: concept, innovations, applications and future. 23. Non-Coding RNAs: Multi-Tasking Molecules in the Cell. 24. Reprogramming of mesenchymal stem cells derived from iPSCs seeded on biofunctionalized scaffold for tissue engineering. 26. Regeneration and bioengineering of transplantable abdominal organs: current status and future challenges. Professor Thomaz - Soccol is Research Fellow of CNPq - Level 1A in the Federal University of Paraná, Brazil. She graduated in Veterinary Medicine from the Federal University of Paraná (1978), Master of Science (Biochemistry) from the Federal University of Paraná (1981) and Ph.D. in Parasitologie Faculte de Medecine - Universite Montpellier I - France (1993) and Post Doctorate in Parasitologie moleculaire the Institut de Recherche pour le Development, France, 1998. Professor Thomaz-Soccol is senior professor and heads the Centre for Molecular Biology from PhD program of Bioprocess Engineering and Biotechnology at Universidade Federal do Paraná. She has experience in the area of Parasitology and Biotechnology. She has supervised more than 100 masters and doctors, created the MSc and PhD in Microbiology, Parasitology and Pathology at the UFPR, Curitiba and Industrial Biotechnology at the Positive University, Curitiba. Her main focus is the area of the development of biotechnological inputs for human and veterinary immunodiagnostic and vaccine compositions, and related to infectious parasitic diseases. She has 492 publications/communications, which include 10 patents and design copyrights, 04 books, 31 book chapters, and 240 original and review papers, with h index of 28 and > 5422 citation (Google Scholar). Prof Rodrigo R Resende graduated in Pharmacy, Biochemistry (2002) and Biological Sciences (2003) from the Federal University of Alfenas, Ph.D. (Biochemistry) from the University of São Paulo (2007) and Post-Doctorate in Biophysics (2008) and in Physics of Nanomaterials (2009). Head of the Cell Signaling and Nanobiotechnology Laboratory, Adjunct Professor Department of Biochemistry and Immunology, Federal University of Minas Gerais. Founding President of Brazilian Society for Cell Signaling and Founding President of Nanocell Institute, a non-profit organization for researches development, sciences and education promotion in Brazil (www.institutonanocell.org.br), also he was the founder and creator of the popular science journal Nanocell News (www.nanocellnews.com.br). He created the MSc in Biotechnology at UFSJ, Minas Gerais. His research expertise is in the areas of biochemical technology, nanobiotechnology, cell signaling, stem cells differentiation, direct reprogramming somatic cells and tissue engineering. He has published over than 75 papers, six books, 23 book chapters and has nine patents. He has supervised 14 master, doctors and pos-doctors.